Secondary data consumes about 80% of enterprise storage capacity and imposes a huge burden on enterprise IT budgets. The fragmented infrastructure typically used for storing backups, archives, test/dev and analytics is inefficient and expensive. Cohesity DataPlatform is the only hyperconverged platform designed to consolidate and manage all your secondary data at web scale – including backups, test/dev copies, files, analytics data, and objects. DataPlatform provides distributed storage with best-in-class space efficiency, efficient copy data management, and native cloud integration. The platform incorporates data management functions for converged data protection, in-place analytics, and copy data management to automate DevOps workflows. 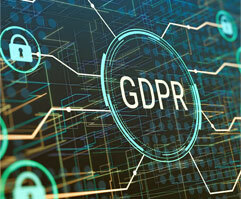 With an enforcement date of May 25, 2018, the General Data Protection Regulation (GDPR) is designed to unify data privacy requirements across the European Union (EU). If you are a US-based company, marketing to or processing the information (PII) of EU end users, customers and/or employees, you are also obligated to comply to the GDPR requirements. These regulations will set a new standard for the protection of Personally identifiable information (PII) and consumer rights, but businesses will be challenged as they put systems and processes in place to comply. Cohesity simplifies GDPR compliance by converging secondary data onto a software-defined, web-scale platform, reducing fragmentation. Enterprise data, including PII, is stored in silos both on-premises and in clouds where fragmentation, lack of visibility, and legacy products make it difficult to discover and search. Poor protection and limited data access and reporting is unacceptable under the GDPR. To comply with the GDPR, companies must know exactly what PII they have, where it is stored, how long it has been stored, and whether it has been breached. Learn more about Cohesity and GDPR compliance. Since 1989, Mainline has invested in strategic partnerships that deliver the right solutions and services to our customers to help them increase their effectiveness. We are witnessing, first-hand, the explosive changes happening around enterprise data and the way that data is stored. In particular, secondary data is typically stored on fragmented, expensive infrastructure. Cohesity is a solution that’s driven by engineering excellence and is focused on solving our customers’ rapidly growing data storage problems. The web-scale design and cloud capabilities are native to the Cohesity platform, addressing all secondary data needs in a single, cost effective platform.